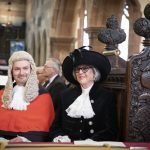 Dedicated charity fundraiser is officially appointed High Sheriff of Clwyd | News by Wales Express News, People Before Profit! A DEDICATED charity fundraiser has been officially appointed as the new High Sheriff of Clwyd and pledged to be an ambassador for good causes. Stephanie Catherall took over the independent, non-political Royal role during a ceremony at St Deiniol’s Church in Hawarden. The origins of the office date back to Saxon times when the ‘Shire Reeve’ was responsible to the king for the maintenance of law and order within the shire, or county, and for the collection and return of taxes due to the Crown. Mrs Catherall, who lives in Nercwys, is now one of 55 High Sheriffs serving the counties of England and Wales. 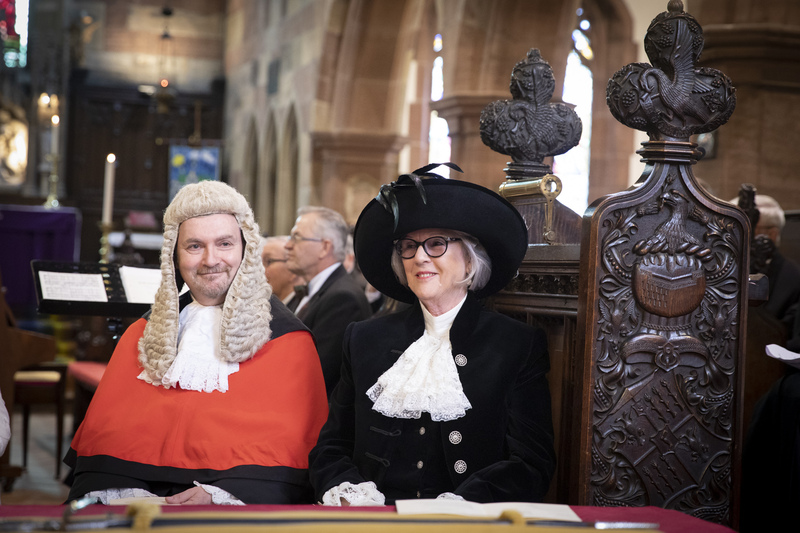 In a speech to the congregation, Mrs Catherall pledged that her year in office would be focused on championing volunteers in the region and using her influence to raise awareness of their charitable work. She said: “In my year of office, I will look forward to meeting and supporting the many people who make such important contributions to our county. She also pledged to be a champion for the North East Wales Carers Information Service, known as NEWCIS, which Mrs Catherall first became aware of while caring for her late mother. One of her other main focuses will be raising awareness and funds for Nightingale House Hospice, based in Wrexham, a cause which Mrs Catherall and her husband have a long association and have raised money for since the death of her father-in-law 30 years ago. Mrs Catherall said: “I have always enjoyed and taken a lot of pleasure from raising money for good causes. It’s something I have done for 30 years since retiring from the businesses I ran in Deeside and I am hoping my past experiences will help me during my year as High Sheriff. She added: “My aim in my year of office will be to focus on volunteering and bringing people together to help one another. I will seek to channel information and cross pollinate ideas so that those special people in our area that are doing extraordinary work get the recognition they deserve and the help they need to make the biggest impact. The office of High Sheriff has been in existence for more than 1,000 years. Duties include attending royal visits in the county and support for Her Majesty’s High Court Judges when on Circuit. Supporting the Crown and the judiciary remains a central element of the role and holders of the title are encouraged to give active support and encouragement to the police and the emergency services. In her role as High Sheriff, Mrs Catherall will sit on both the Crimebeat and North Wales Police and Community Trust (PACT) committees which both aim to support young people and projects which make a difference in their neighbourhood. Crimebeat is the official youth crime prevention charity of the High Sheriffs’ Association of England and Wales. Sheriff-4: Pictured during the ceremony is Judge Rhys Rowland and the new High Sheriff of Clwyd, Stephanie Catherall.